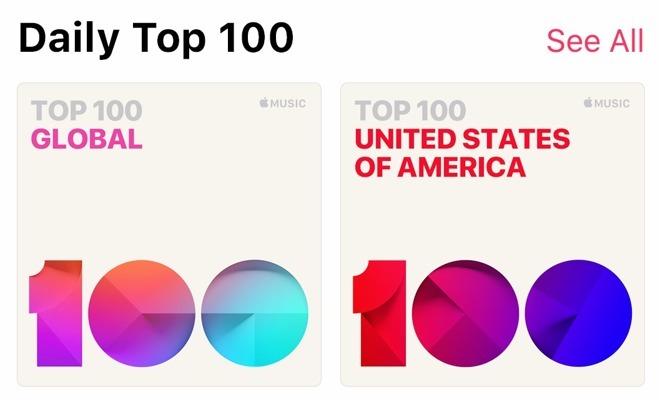 Apple is adding music charts to Apple Music, with 116 "top 100" listings of tracks streamed on the service regularly updating, allowing subscribers to see what are the most popular songs of the day, and potentially discover new songs. Rolling out in a software update to all users starting Friday, the new charts will appear under the Browse section of Apple Music, within the Top Charts area. A list of the charts will appear under "Daily Top 100," complete with a thumbnail depicting the number. Rather than relate to genres, the 116 charts instead consist of a top 100 chart for every country where Apple Music is available, along with an overall global chart, reports Rolling Stone. All charts will update daily at 12am pacific standard time (3am eastern standard time). The rollout of the new charts arrives days before Apple's "Gather Round" event on September 12, which is widely expected to be the launch of new iPhone models, among other products. Software updates, including details of the releases of operating systems such as iOS 12 and macOS 10.14 Mojave, are also expected, with other changes to Apple Music potentially making an appearance at the event. The addition of new charts arrive at a time when the power of streaming services in measuring a song's popularity is being viewed differently. Major charts around the world have updated how they calculate a song's positions in the charts due to the altered changing spending habits of consumers, opting to listen to streams instead of buying tracks or albums outright. In July, Drake topped the Billboard 200 album chart under refreshed rules, where streams were given more weight if they were made through a paid subscription, as opposed to a streaming service. In that week, Drake set a new one-week record for audio streams from a single album in the U.S., achieving over 745 million streams.